Join us for this unique journey from London to Bournemouth, exactly 50 years to the day since the last steam hauled service on July 5th 1967. On a beautiful sunny day, we begin our journey from London Waterloo. Running on the fast line, we take the old London and South Western Mainline via Wimbledon, Surbiton, & Weybridge, saluted by crowds of onlookers. We branch away from the West of England Line at Worting Junction and contiune south towards Winchester. We then pass through Eastleigh, the spiritual home for so many ex-Southern Railway locomotives before coasting through Southampton. Once clear of the restrictions we speed through the beautiful New Forest before arriving at our destination, the seaide city of Bournemouth. With the British Pullman carriages in tow, and an ex-Southern Railway, Merchant Navy Locomotive at the helm, a recreation of a classic express from steam days does not get better than this! With live sound recorded from the locomotive, we bring the action right to you. 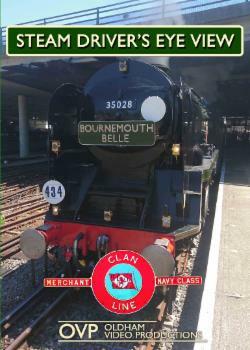 This program also features commentary titles & locations, along with driver’s commentary and several lineside locations.